An online collaboration between Te Kura students has been recognised in a New Zealand competition. This successful project was also described in Jan Bolton’s citation when she received a Teaching Excellence Award from AADES. 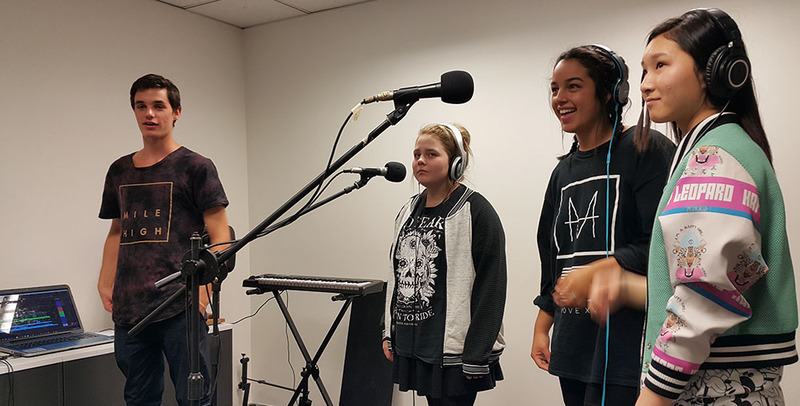 The song Echoes of the Sun is the result of a collaboration by many Te Kura students. The song won the music section of the Create1World Creative Activism competition in both Wellington and Auckland. This conference for high school students has a range of competition categories across the arts. The project included 56 students involved in the song development; writing lyrics, the composition of music that’s both electronic and instrumental, and instrumental and vocal performances. 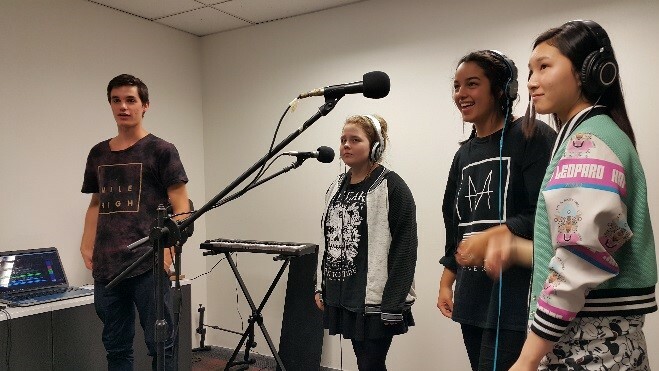 This song was also recorded and mastered by students. Another stage of the project was the production of a music video that again represents the contribution and talents of many students and continues themes from the song, such as the celebration of diversity. Bayley was one of the lead students on this project. He’s been playing piano and drums from the age of 9 and started writing and producing music when I was 13. Now in year 13 he aims to study music next year, most likely at Auckland University. Bayley had a central role in taking everyone's ideas and putting them all together, adding what needed to be added and then mixing and mastering everything. Bayley and his father Doug set up a recording studio at Te Kura’s Auckland office to record vocals and some of the instrumentals. Among many other talented students, Seth Austin provided a seminal guitar track for the song, and Matthew Beardsworth - another great talent in music- also contributed orchestration sections. Renee Plumpton, Taylor Taraare, and Ada Wong are lead vocalists and joined the Auckland recording sessions. A number of Te Kura staff encouraged student participation at different stages of the project, including being present at the Create1World Finals (in Auckland Hayley Yoon and Robert Blucher and in Wellington Joan Aitken and Jan Bolton). Jan says that with this collaborative project she was keen to challenge some of the perceptions around distance education and show what is possible, she says, “The end result is something that could never have been achieved by just one or two people alone, and which reflects the unique character of Te Kura and its students”. Jan says a key part of these projects is that they are in the hands of the learners and by teachers having high expectations, mentoring and facilitating, young people can have fun and learn deeply, picking up necessary qualifications along the way. Jan Bolton says that involvement in Create1World has allowed our students to continue to be proud of their effort, and the students who attended said they appreciated the chance to think further about opportunities. Jan says the prize money rewarded to the school can go towards another collaborative project. 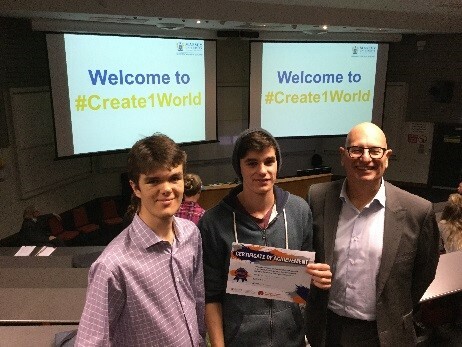 Te Kura students Matthew Beardsworth and Bayley Milne, with Northern Regional Manager Robert Blucher accepting the music prize at the Create1World conference. 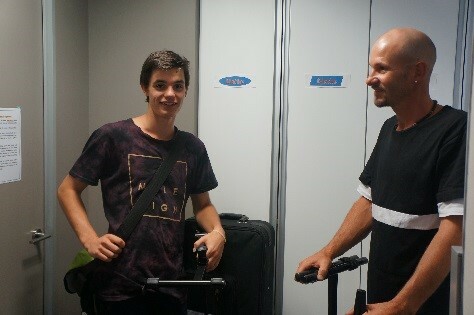 Te Kura student Bayley Milne and his Dad Doug, setting up a recording studio at our Auckland office. The song’s lead vocalists Renee Plumpton, Taylor Taraare, and Ada Wong at the recording studio.